Stop hustling gigs and start building a disruptive business. You can’t disrupt if you’re just chasing down the next customer. 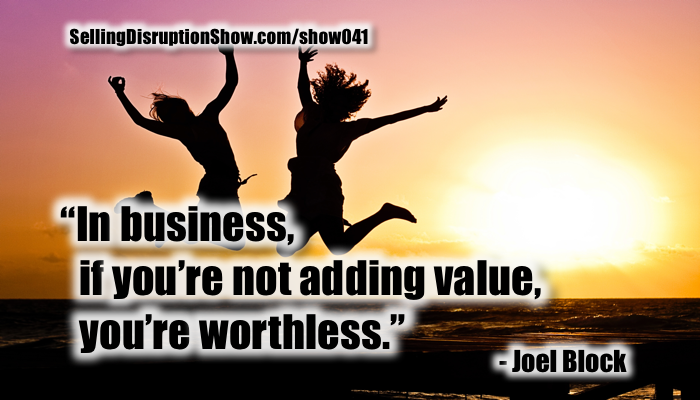 Money maven and author, Joel Block shares insights from his three decades of business on how to build a revenue octopus to take all the money possible off the table and still have a happy customer. Listen to Joel on another episode. Mark S A Smith: Our guest today is a repeat. He was so popular I’m bringing him back to talk about more. The Money is in the Money, Joel Block CEO at Bullseye Capital. He just released his Stop Hustling Gigs and Start Building a Business. He is a hedge fund investor, lots of experience in venture capital. Joel know business, welcome back Joel Block. Joel Block: Hey Mark, thanks man. Nice to hang with you. Mark S A Smith: You bet, you too my friend. You are definitely my guru when it comes to creating wealth and money. Let’s talk about your new book, Stop Hustling Gigs and Start Building a Business. Tell me about … why do people hustle gigs? What’s the thing that drives people to do that? Joel Block: They don’t do it on purpose. It’s not like people sit down and write a business plan and say I’m gonna hustle a bunch of gigs that’s … it’s just sort of what happens. They get one deal and then they scramble around and they get another deal and they’re proud of themself and they scramble around and get another deal but they don’t have a strategy in advanced that ties all these things together. Mark S A Smith: I think you’re absolutely right. Most entrepreneurs start off with somebody saying, “Hey, can you” for example, “fix a computer for me?” Well sure, I’ll be glad to and then they move to the next step. “Well what do you charge,” and then they say the largest number they can without stammering and that’s how they get into business. Joel Block: … to go and give them the thing. Here’s the thing, it’s not done subject to a plan, there’s no big picture. Because of that reason, they end up leaving a lot of money on the table. Joel Block: And so if you are a little more strategic, if you’re a little more thoughtful and planned, you’re gonna make a lot more dough and that’s really what this is about. It’s 101 strategies for thinking out how exactly are you gonna benefit yourself and it’s a tiny little book. I mean, there’s nothing complicated about this. This is really simple. This is me spitting out the best ideas that I’ve come up with over my 30 years in the hedge fund and venture capital worlds and sharing with entrepreneurs and people who are gonna make something good of themselves. Mark S A Smith: I like it so how do we make that transition, from hustling to actually creating a planned business that can scale, it can be profitable so we take all the money on the table? Joel Block: Let’s say you don’t start at the drawing board. Let’s say for example, you get the phone call that says, “Can you fix my computer” or whatever it is. If you take a step back and you think about what other companies do and take a look at other companies because other companies … when you go to business school you look at case studies of other business, you study what other companies do. You pick out what they do well, you leave behind what they don’t do well so stop and think for a second, do successful companies hustle gigs? Now, I can tell you that they do not so let’s say for example, you go into a hotel. You’re in Las Vegas, you go in a hotel in Las Vegas. You walk in and you say, “I need a room”. The base room is just a regular one bed room. Do you want a better room or do you want the regular room? Okay well, we want a better room so now they just got more money out of you. Then once you get into your room you say gee I’m a little hungry and you go down and you go to a restaurant and then when you go to the restaurant you say boy, now I need to go get a little exercise so I’m gonna go to the spa and then you go to the gift shop and then you go buy some clothing at the souvenir place and then you gamble in the casino and … you get what I’m saying? Joel Block: When you walk into a place they’ve got 20 different things for you to do. They’ve got a lot of different ways for you to leave money in their business and if you get a job fixing somebody’s computer and then you leave and you hustle and go get the next one, you’ve pretty much left every opportunity and the theory is this, it’s easier to go deep with somebody from a sales perspective. You and I are salesman. Joel Block: It’s easier to get somebody to buy something from you a second time than it is for you to go get somebody to buy something the first time. Mark S A Smith: Yeah because of the trust, the confidence that isn’t building. Joel Block: Yeah of course and we could do a whole segment on all of those things but the second that you’ve got somebody who likes you, trusts you, wants to work with you, feels comfortable with you, not to mention it’s inconvenient for them to look around for new people too. So once you’ve got somebody that likes you, sell them more stuff, whatever the stuff is. That’s what requires the planning, is well gee once I talk to somebody what else could I sell them? And the concept of developing many more things to sell is called a revenue octopus. Joel Block: So you have to have your multiple streams of revenue lined up so when somebody says, “Gee Mark, I really like you, what else can we do together?” “Well not only can you get a hotel room at my place but you can go to a restaurant and go to the spa, go to the casino, go to the gift shop”, you’ve got all these different things that you can do and there isn’t a single entrepreneurial business that can’t come up with a really good revenue octopus and give consumers lots and lots of ways to do business with them. Mark S A Smith: I love it so give me some examples, other businesses other than a casino where you can create a revenue octopus? Joel Block: Let’s look at some other big ones. Mark S A Smith: Alright. Joel Block: Let’s look at Starbucks for a second. Joel Block: So you go into Starbucks for a cup of coffee and they say, “Well, do you want a big cup of coffee, a little cup of coffee”, tell them what you want. “Do you want a fancy cup” and they’ve got names of coffee that take a minute to rattle off. So they’ve got all different types of coffee and then you’re sitting there drinking coffee and you say, “Gee, I’d sure like to have a souvenir shirt that I can wear around because I like Starbucks” so you buy some accessories like clothing. You can buy a coffee maker, you can buy mugs, you can buy gift cards, you can buy beans that you can take home and you can consume the coffee at home. You can go to the supermarket, you can buy Frappuccino’s at the supermarket if you want to. Mark S A Smith: That’s right in bottles yeah. Joel Block: And then when you go to Costco, they not only sell beans in the store, you can go to Costco and you can buy beans in bags five pounds each so you can have bags and bags of beans all over your house. You can roll around in beans. You can do whatever you want. They’ve got lots and lots of different ways and maybe the ultimate way is that they sell a credit card and when you signup for their credit card, credit card allows you to go shopping and do the things you want and they probably get a little nick on every purchase you make forever. So the bottom line, what did Starbucks do? They didn’t say that their best asset is their coffee, their best asset is their customer and so they go, how can we go deep with the customer? What does this customer want when they come in our store? So they come in, they sit in the store and they go well we can sell them all these more things and that’s how you lay out a revenue octopus. 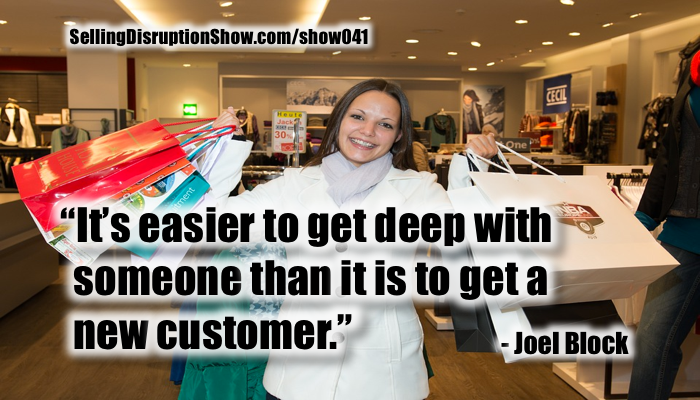 Once you’ve got that customer in your store, what else can we sell them? Now notice that Starbucks doesn’t sell them airplane tickets and they don’t sell them movie tickets. They’re not selling them things that are totally outside of the purview of what a coffee drinker wants from Starbucks but they take advantage of everything related to what a Starbucks person wants, including branded merchandises et cetera. 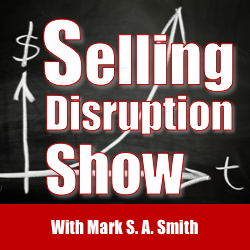 Mark S A Smith: I think that’s absolutely brilliant Joel, you said the best asset isn’t your product but your customer and that’s absolutely in alignment with the selling disruption principal of stop bringing new customers to your products instead bring new products to your customers. It’s how we make lots and lots of profit. Joel Block: Because it goes back to the same principal, it’s easier to go deep with somebody than it is to get somebody for the first time. Joel Block: For whatever reason, entrepreneurs resist this principal and that’s the reason that most of them just hustle gigs. It’s very difficult to take care of your family, pay your mortgage, plan for a vacation, set aside money for college and do all the things that you gotta do when you jump from gig, to gig, to gig, to gig. You need some continuity, you need to know that a customer’s gonna buy one thing and they’re gonna go deep, deep, deep, buying many, many more things and the deeper they go, the more entrenched they get with you, the more likely they are to make referrals and it goes on and on. Mark S A Smith: Well, I think the other aspect of this that’s important is if you’re bringing disruptive products to market, you have to bring them to customers who you have a relationship with. Who are willing to listen to what you have to say, without having resistance to something new. Mark S A Smith: And so you always bring your newest products, your most disruptive products to people that you already know so you have to build that fan base if you’re gonna bring out something new successfully. Joel Block: Going deep is a big part of that component and I promise you when you go deep, that’s when you’re going to really see your revenues increase for your business, and your profitability by the way. Mark S A Smith: Absolutely true because the deeper you go the more profits there are to make and the less resistance and the less competition that you face as well. Mark S A Smith: Give me some examples, how to go deep with a customer? Joel Block: First of all, you build a revenue octopus, that’s the single most significant way to do that. Mark S A Smith: So number one, figure out the revenue octopus. Joel Block: Yeah, even maybe before you do that, once you’ve hustled a couple gigs and you go wow, this could really be something I can see I can make money doing this. Then you start laying out some revenue streams, then you gotta make sure that you’re using the right kind of a business model and a business model is the way your company generates revenue. So let’s say you’re a franchise, that’s a business model. Let’s say that you’re a brick and mortar store where customers come in, like you’re a dry cleaner, that’s a business model. Let’s say you’re Amazon and you sell things online, that’s a business model. Costco’s business model for example is membership plus a small markup so different kinds of companies have different kinds of business models and you have to decide what business model is gonna work for you. Once you decide that, then you can layout all the many different things that you can do. So let’s look at Costco. So they sell a membership and once you got a membership they sell you all kinds of stuff. They’re now selling travel, they sell auto insurance, I think the last five cars that we bought, we bought through Costco. Joel Block: Because you walk in and you say to the dealer, “Hey listen”, you don’t have to haggle and not like I’m not good at it but I don’t have the energy to haggle all the time anymore and so I walk in I say, “Listen, I’m with Costco. I want the best price” and I’m feeling pretty comfortable that within a couple hundred bucks it’s probably the best price I’m gonna get anywhere. Joel Block: Might I get it better if I screamed and yelled and haggled like crazy, I might do $200 better but you know what, spread over a couple of years I don’t care. Costco has made it very, very easy for me as a consumer to feel comfortable that I’m getting a very low price. It may not be perfect but they do a brilliant job of making me comfortable and I trust Costco and if I don’t like it I can bring it back and if something’s not working out, they stand behind it. So that’s their business model. Mark S A Smith: So the idea is, it doesn’t have to be optimal but it does have to be easy. That’s what Costco brings to the party. Joel Block: I don’t know that, that sentence works in every single situation but for Costco it works for me that I believe 99% of the time it’s probably the best price and 1% of the time it’s probably a really, really good price. Mark S A Smith: Well, the reality is that optimal requires a lot of energy and so for a lot of people, they’ll choose easy over optimal. Joel Block: Well, let’s put it like this perfect is a fiction. Joel Block: There is no such thing as perfect so you gotta get something that’s pretty good, that you’re happy with. If I found out that one time I got really taken to the cleaners by Costco, I would lose faith but that’s never ever happened in 15 or 20 years. Joel Block: They just always deliver a very good value and they negotiate on my behalf with tremendous buying power. Now, that makes me feel a little bit bad for entrepreneurial people because I root for entrepreneurs but on the other hand, Costco has done a good job and entrepreneurs need to learn to do a good job too and that opens up another discussion and that discussion is that Costco operates in this big 80% blanket, entrepreneurs need to operate in specialty niches, little cracks, crevices and places where we can accel. Mark S A Smith: Absolutely true and that’s the entrepreneurial spirit and that’s where create value and Costco does a fantastic job doing what they do, which is as you pointed out is create extraordinary deals by strong negotiating for us. I really like the way that you packaged that. So far, the zero step is hustle a few gigs, step one is create a revenue octopus, step two is use the right type of business model. What’s next? Joel Block: Then you gotta just go sell. My book as six or eight different ways that I like to sell, some techniques that I like and for the most part I believe are related to selling. Number one, you have to add a lot of value. If you’re not bringing value, you’re worthless. Big companies can maybe get a way with it because they can operate on price. Little guys cannot operate on price, we need margin. We need to have enough juice left in the deal that there’s something in it for us and if you’re not careful, you can give all your margin away and that doesn’t work at all. The second thing is, if people ever say to you that they don’t have the money, it’s a fiction, it’s not true. 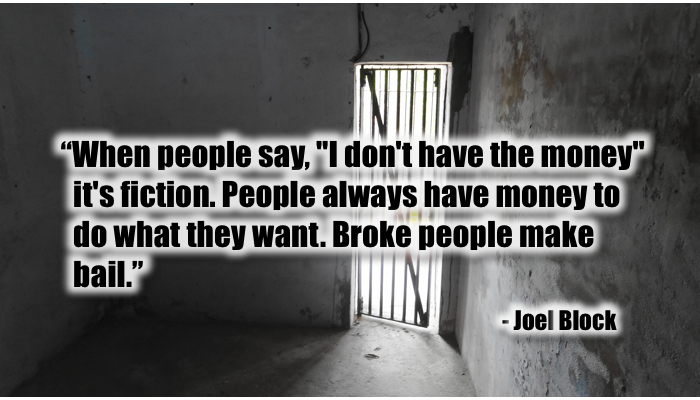 Joel Block: What it means is that they don’t want to buy something for you for whatever reason but I can promise you people always have enough money for the things that they want to buy and the way you know this is that there are a lot of broke people who somehow make bail when they go to jail. Mark S A Smith: That’s great. Joel Block: Somehow no matter how little money you have, when you’re in jail you find the money to make bail and that’s it. If it mattered to them, they would do it so clearly when they’re saying no to you, you have not made it important enough to them for them to say yes to you. Joel Block: And you have to work harder, you always have to point the finger back at yourself and you always have to think, how can I be more valuable and you listen. You gotta find people who have problems that you can solve. Joel Block: It’s well known that Americans take 10 times more painkillers than we take vitamins. Don’t sell roses and flowers, sell taking away problems. And another thing that I like to say … and this is also well known, is that businesses do not have problems. There are no problems in business. 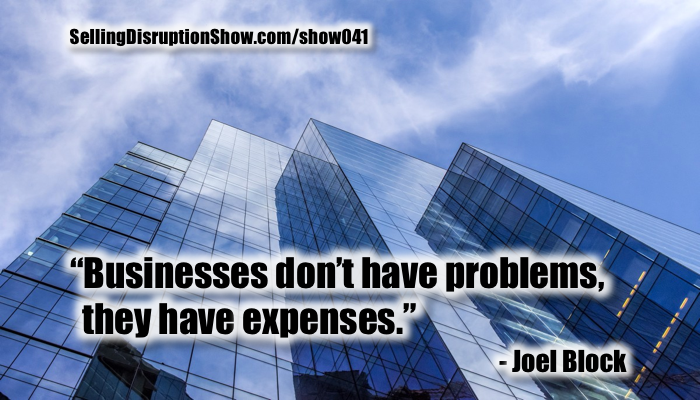 Businesses have expenses, they do not have problems because there isn’t anything in business that cannot be made to go away without throwing a few dollars at it. That’s not true in your personal life, in your personal life there are lots of things that are problems that you can’t make go away like health problems and medical situations and things happen that are different in business than with people. So if you’re a little business that deals with other businesses, they don’t have problems. They have expenses and there’s some number of dollars that they’re willing to spend to make a problem go away. If that problem is inside of your bailiwick and you’re good at making it go away, if it’s a big problem they’re gonna pay you a big sum. It’s very, very simple. You don’t have to make this complicated. Mark S A Smith: I think that’s a really brilliant business statement, so in business to business we’re talking about solving problems that they’re willing to pay to make go away and when we talk business to consumer, we’re talking about something a little different. Joel Block: It’s a little different yeah. Mark S A Smith: It’s about resolving pain or making a dream come true. Joel Block: Yeah, I don’t generally work a lot with consumers so that’s not really my expertise but I think you just summarized it pretty well. Mark S A Smith: Well, I think it’s important for us to differentiate between how you sell to businesses and how you sell to consumers. They’re very different strategies, different marketing strategies, different sales strategies and different business models as you clearly point out and so if you are in … listener, a B2B or B2C business, make sure you think clearly about how you go about this and don’t confuse the two. Joel Block: No, no for sure. Mark S A Smith: Now that said, sometimes you do have a B2C element when you’re selling B2B and that is if you’re selling something specifically to an office or to an individual that resolves and individual problem they have in their business, then it becomes a more crossover type of product versus a product that’s purchased as an expense for the business. Joel Block: But it’s still probably using company resources. Joel Block: … and they still think about it the same way. Part of what’s different about dealing with consumers is that consumers own their own money. Mark S A Smith: True. Joel Block: Corporate guys do not own their own money and when you’re dealing with people who do not own the money, not necessarily easier by the way. I find it sometimes easier to deal with people who own their money. It’s different and you have to understand the dynamic. Mark S A Smith: I think that’s a really valuable point. Consumers own their own money. Corporate buyers don’t. On the other side of that, from a sales standpoint, if you’re a sales person and you’re offering a discount to a corporate buyer, you’re taking money out of your pocket but you’re not putting in their pocket. 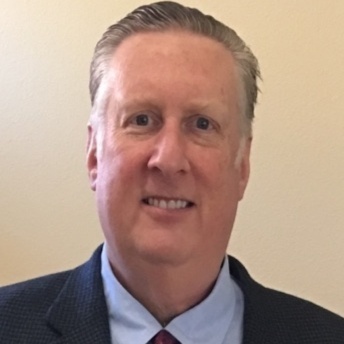 Joel Block: Well, that is true but that being said, frequently, depending on who you’re talking to, if you’re talking to an administrative, like a purchasing agent kind of person, they’re required most of the time by corporate rules to take advantage of discounts. Mark S A Smith: That’s right, which is to your advantage. Joel Block: So if you say to somebody, they have to do it so if you say listen we’ll give you 2% NET10 and you give them a discount for paying in 10 days or paying on the spot or whatever. They’re usually required to take that discount because those discounts add up to huge savings in the aggregate for a corporation. It may seem like very little money on a single transaction but multiply that by hundreds of thousands of transactions and they save millions and millions of dollars so a lot of times they’re required to do that so those are strategies you can use for collection. Mark S A Smith: I like the idea of cash discount for immediate cash payment. I think 2% on 10 days is a little bit much but half a percent for right now makes a lot of sense. Of course, you have to figure that out for your business model. Joel Block: Let me tell you even a better strategy than that. Mark S A Smith: Let’s hear it. Joel Block: That’s kind of what everybody does just 2%, that’s kind of a standard number, 2% for payment within 10 days but even better, be so valuable to your clients that they will do whatever you ask them to do. If you’re that valuable, if you are so valuable where you solve problems and they really need you, if you are really an authority, if you are really the best solution in the marketplace, then you can say, this is how we operate. We take payment in advance and here’s how we work and they’ll say you know what, we appreciate that and we’re fine to go along with your program because we really want your help. And if you provide that level of service, support and excellence, they will go along with your program. If they don’t think that you provide that level of service, support and excellence, then they’re not gonna go along with your program. They’re gonna say you know what, you’re a commodity like everyone else, you’re gonna do it our way instead and then you have to decide yes or no. So what I would tell you, be outstanding, be the best solution in the marketplace add huge value and all of this stuff is all part of Stop Hustling Gigs. It’s the way you stop hustling gigs, is be serious, be a serious business person. It’s really gonna do some serious stuff. Mark S A Smith: I love it that’s really extraordinary. I think what you just said was absolute business dynamite. If their forcing you to use their payment terms, they see you as a commodity. You are skating on thin ice. Joel Block: Yep and you’ll be booted the second somebody else comes along. Mark S A Smith: That’s right you’re easily replaceable so this is an extraordinary test to find out how valuable you are. Will they do whatever you ask them, if not, you need to generate more value, you need to go deeper, you need to create some new revenue octopus arms. Joel Block: Yep, that’s it. That also speaks to why entrepreneurs really need to be specialized. Costco is general because they’re so big but we need to be specialized because we’re little, we need to explain what we do in a very succinct way. We need to be really good at it and you can’t be really good at a hundred things. You can be good at one or two things, that’s it. Get really good at something, charge a lot for it, write business rules that explain what it is that you want and how you want it and ask for it. Be proud of yourself. Mark S A Smith: I love it. I love it. Really, really good stuff. 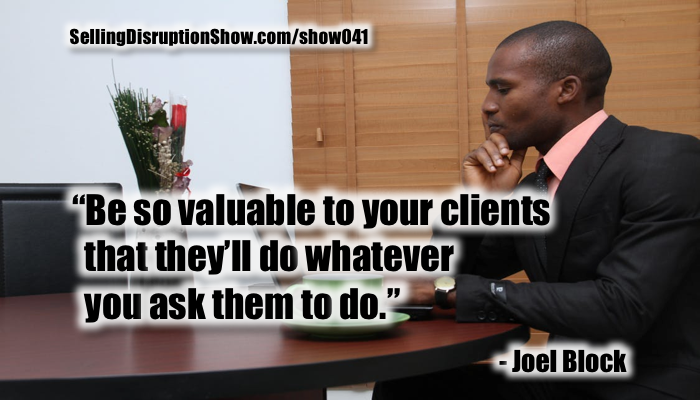 Thank you Joel for sharing some of your 101 insights on How to Stop Hustling Gigs and Start Building a Business. What’s the best way for our listener to get a hold of you if they want more conversation with you? Joel Block: Go to the website bullseyecap.com all of our information is there, the book will be there, some of the other things that we do will be there and people can learn probably a lot about us by looking at that material. Mark S A Smith: Excellent, they’ll also be a link on the show page to the book. Thank you so much Joel for sharing your wisdom and How the Money is in the Money. Joel Block: Yeah it is, it is. Mark, take care man.